Transmits duty cycle with resolution of 1%, 0.1% or 0.01%. Duty cycle is a measure of ON or OFF period as a percentage of total period. Duty cycle is determined by averaging an integral number of periods over a gate time which is selectable from 10 ms to 199.99 s. The same signal is applied to Channels A and B. The transmitter divides the average pulse width t by the period P between pulses and expresses the ratio t/P in percent. A resolution of 1%, 0.1% or 0.01% is selectable. By selecting leading or falling pulse edges, ON or OFF duty cycle can be transmitted. Pulse Width Modulation (PWM) is a transducer output format where the measured information is provided as duty cycle applied to a constant frequeny, such as 120 Hz. As for duty cycle, the transmitter divides the average pulse width by the period between pulses over a gate time which is selectable from 10 ms to 199.99 s. It then scales this ratio mathematically to transmit this ratio in engineering units, such as relative humidity (RH). 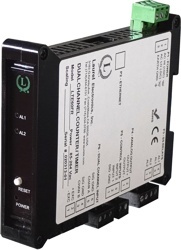 The Laureate duty cycle & pulse width modulation transmitter uses an Extended counter transmitter main board and the FR dual-channel signal conditioner board, which accepts signals from 12 mV to 250 Vac, inputs from proximity switches with an PNP or NPN output, TTL or CMOS logic, and contact closures. Jumper selections provide optimum operation for different sensor types and noise conditions. A built-in isolated 5, 10, or 24 Vdc excitation supply can power proximity switches and other sensors. Grounding Common ground for channels A & B. In duty cycle mode, the transmitter displays ON or OFF time in percent from 0% to 100% of period for repetitive pulse trains. In the illustration, duty cycle in percent is 100 x t/P. In pulse width modulation (PWM) mode, the meter also determines the duty cycle ratio, but then scales this ratio for display in engineering units.